Moyle Thomas and Evelyn Marie Newren Binns: Moyle was the oldest son of Tom and Louella Binns (q.v. ), born June 24, 1905, in American Fork. He attended Harrington and Forbes elementary schools through the sixth grade. The family moved to Highland in 1919 and Moyle attended Highland School for one year then went to American Fork High School, graduating in 1924. That summer he worked for the U.S. Forest Service in the mountains near Kamas then went to Scofield to work on the Staley ranch, hauling hay. That fall he returned to Highland and attended BYU for a year then went back to Scofield for haying in the summer then worked at the mines in Winter Quarters and Scofield for two years. There he met Evelyn Newren and after he had attended the University of Utah for a year they were married in the Salt Lake Temple on April 25, 1928. Evelyn was born May 16, 1909, in Scofield, UT to Bernard and Hildur Olson Newren. After their marriage they lived in Scofield and both of them worked at the mine. Moyle also played the saxophone and trombone with a six man orchestra that played locally and toured throughout Southeastern Utah. Thus they spent the next several years and their first child, Farrell Newren, was born. 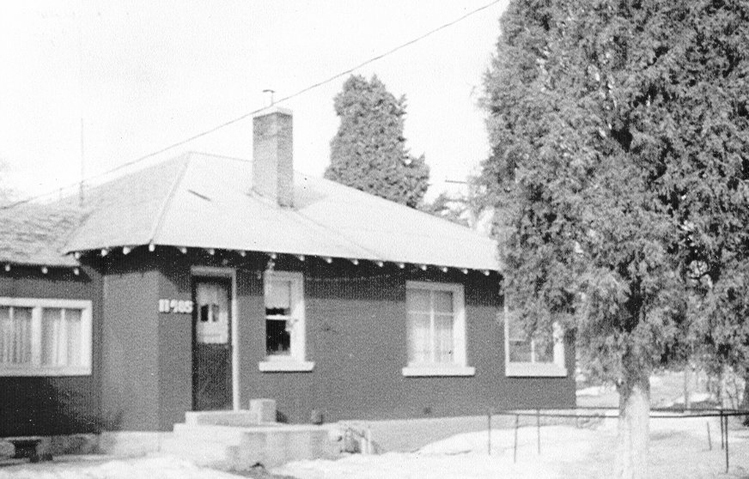 in 1938 the began building a home on Highland, across the street from his parents (#30) and moved into it in May, 1939. They lived there for less than five years then moved to Richland, Washington where he was employed by the E. I. DuPont Co. at their Hanford Engineering Works. He left Highland in December, 1943, and his family followed in early 1944. Their home was left empty for about four years then they sold it and it was moved to American Fork where it still stands, in 2018, at 165 East 200 South. Moyle later worked for GE and for Douglas United Nuclear, retiring from there in 1967. They had two other children: Shirley Evelyn and Louella Ann. Always active in the Church of Jesus Christ of Latter-day Saints, he was Elder's Quorum President, Ward Clerk and Chorister for many years. Moyle died December 25, 1974, and Evelyn died March 24, 2003. They are buried in the Desert Lawn Memorial Park in Kennewick, Washington. Thomas and Mary Louella Moyle Binns: Tom was born May 16, 1875, in American Fork to Isaac and Ellen Singleton Binns and Louella was born June 1, 1883, in Alpine to Stephen and Alice Greenwood Moyle. They were married March 30, 1904, but due to the staunch Presbyterianism of his father, Tom was not baptized into the Church of Jesus Christ of Latter-day Saints until after his father died. They were sealed in the temple in 1921. They built a home on Highland in 1919, down in the creek (#28 on the 1958 Highland map - interactive, larger) where they could have running water in the house. They had two sons, Moyle Thomas, born June 24, 1905, and John Alma, born Dec 19, 1911. They worked faithfully in the Church for many years, organizing the Old Folks committee in 1920 with Louella as Lady Chairman. She also worked many years in the Young Women, Primary and Relief Society, serving as president for seven years with Emily Miller, Esther Bowen, Vera Larson and Mary Lee Myers as counselors and Kate Rogers and Henrietta Larsen as secretaries. In June, 1948, while out irrigating, Tom’s car slid into a ditch sideways and with help from the Bunkers he was able to get it out after about 1 ½ hours. The stress and effort, along with his failing health caused him to catch pneumonia and he died a few days later (June 18). Louella soon moved to American Fork where she became active in the D. U. P. She died April 20, 1965, at her home. They are buried in the American Fork City Cemetery.